Visit the Dorje Shugden Blog for the lastest updates. For all this time he has refused to answer. ...From the AP reports, Seattle, April 14, 2008: Inside the (University of Washington) arena, the Dalai Lama received an honorary degree and spoke of the importance of employing dialogue and mutual respect to solve problems. "You will make this century of peace," the Dalai Lama told students. "Today's world (is) heavily interdependent. Destruction of your neighbor or enemy is destruction of yourself." ...From The Washington Post, April 20, 2008: Dalai Lama Urges Religious Tolerance. ANN ARBOR, Mich. -- The Dalai Lama encouraged people gathered at the University of Michigan on Saturday to preserve their own religious traditions while respecting others with differing beliefs. "As you know, I always believed, since all different traditions have the same potential to bring inner peace, inner value, . . . it is important to keep one's own tradition," he told about 8,000 people at Crisler Arena. For example, the Dalai Lama says that Wisdom Buddha Dorje Shugden is a spirit who causes harm to his own life and the cause of a free Tibet. However, every Buddhist knows that if you go for refuge to Buddha, Dharma and Sangha, you are protected from harm from spirits. So how can such a spirit harm a supposed Buddha? How can such a spirit affect the cause of a free Tibet? It makes no sense, but of course these reasons are designed to produce a powerful emotional response in the intensely nationalistic, devout and loyal exiled Tibetans. If you now read the points on the right, you will see actions and behaviour that are contradictory and hypocritical. If you say one thing to everyone in the West, but in your own backyard you engage in systematic calculated political religious repression, then what is the world to think? The purpose of this website is not to slander the Dalai Lama, but to point out a grave mistake that he is making. We urge him, yet again, to lift his ban on the practice of the Wisdom Buddha Dorje Shugden and to ask his followers to stop persecuting Dorje Shugden practitioners right now. We don't like hypocrisy. We hope you don't either. 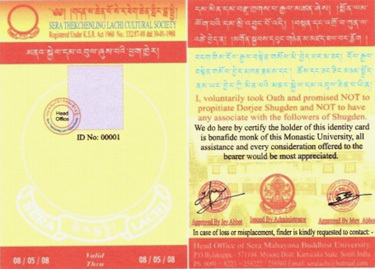 - What is the Western Shugden Society (WSS)? - Why is this religious suppression taking place? - Are the Dalai Lama's reasons valid? - Can the Dalai Lama ever make a mistake? - Is the Dalai Lama the only spiritual leader in Tibetan Buddhism? - Spirit worship or authentic Buddhist practice? - What would Thomas Jefferson think of the 14th Dalai Lama? This website is compiled by some Western and Tibetan supporters in the Western Shugden Society. Contact Us. The Western Shugden Society (WSS) is an ad hoc coalition of Dorje Shugden practitioners from many different countries. The immediate aims of the WSS are expressed in a letter sent to the Dalai Lama.